I love anything shiny, or that’s what my husband thinks anyway. He’s probably right. A safe bet for Christmas presents is always jewelry. Step that up a notch with jewelry that reminds them of the meaning of Christmas and God’s love for them. Enter DaySpring and you’ve got an amazing store that sells beautiful Christian jewelry (and cards, gifts, books etc.). I love working with them because of the meaningful message they send with every one of their products. Their vision is to connect people with the heart of God through messages of hope and encouragement every day, everywhere. DaySpring also strives to give Christians tool for communication in fresh, new ways. A couple of weeks ago, they sent me some beautiful pieces of jewelery to try out for myself. Every piece was beautiful and well-made with a reminder of God’s love and grace stamped on it. My favorite item was the God’s Heart for You sterling silver necklace. It’s simple and beautiful and says, “created, chosen, celebrated, and cherished” all the way around it. I’ve been wearing it pretty much constantly the past few weeks and already had the chance to get into a few conversations about it and the words on it. DaySpring is giving $100 DaySpring credit to one Southern Savers reader! You get to pick what you want from their large selection of gifts, books and more. 1. Comment: Leave a comment below telling me the most encouraging thing you’ve ever received from someone. 3. Follow DaySpring and Southern Savers on FACEBOOK, or DAILY EMAIL and leave a comment below that you are. This giveaway is sponsored by DaySpring. I received products to review, but all opinions are 100% my own. Don’t miss all the other Christmas gift giveaways currently running! when I graduated college, one of my college roommates made me homemade recipe cards of all of our favorite recipes we made together. she knew i was nervous about cooking on my own, and this was the perfect gift and ver encouraging! Job offer from a colleague who remembered me years later. Very affirming. The stain glass cross that sits on my nightstand. The most encouraging thing I received the little gifts my kids brought me when they were small – like pictures they drew or dandilions picked form the yard. Little reminders of their love for me were priceless. Mine was a bead for my pandora bracelet from my 19yr old!! When my son was diagnosed with cancer, my best friend of 30 years, sent me a book, Blessed Be Your Name by Matt and Beth Redman. The most encouraging thing I’ve recieved is a baby sitter and a night to take a break and enjoy myself. Power of a Praying Parent Book. Awesome. A card with a story and money. The story talks about a yr when a family did not have any money for the holidays, nothing for gifts or food. A person gave them $50.00 (back in the 50’s) and they made a promise that when they got back on there feet, that they would give $50.00 to someone every year. As a recipient, once I got back on my feet, I was to forward the money on. That will happen this year. After all these years, this has been a gift that has kept on giving. The most encouraging thing that I’ve ever received was a Bible from a co-worker and now a friend who gave me the gift of faith. the most encouraging thing i was given was 3 shares of stock. weird, i know. it’s mostly lost value and my husband wants me to cash it out but i won’t because it was a gift from my mom. she told me to leave it and just watch it. i dont know much about it but i haven’t lost ALL of it. it encourages me to hold onto things even when all odds are against it!! Cards from my 5 years olds that say “I love you Mommy” So wonderful! A bracelet that my 10 year old son bought me while on a school field trip. My husband put Christmas tree cakes in my stocking the first year we were married. It was my first time spending Christmas away from my family and it meant a lot to me, because my mom used to always put those cakes in our stockings. The most encouraging thing I ever received was a tiny sheet of paper over my shoulder in church one evening after requesting prayer for a family situation. It was so small yet so powerful and I still keep it in my Bible to this day holding marking the page it told me to go to: Romans 8:37-39. I read this scripture so often I think I could quote it from memory but wouldn’t try for fear I would leave something crucial out! I send friends to it often when I feel they too could be lifted up and I am soooo grateful to the one that sent me to it. To this day I am not sure who that was, I only felt a tiny touch on my shoulder and saw the tips of the fingers of the person who handed it to me. I don’t know if it was man, woman, child, or spirit; only God knows and it is my believe that the scripture came from Him to me anyway. A figurine that was given to me from the Willow Tree Collection when my son was stillborn. My most encouraging thing was some money given to us for gas at a time when my husband and I had decided to take a leap of faith and trust God! I just got a Comfort Cross, Love it. 4 months before from my wedding, I was living with my family overseas. My fiance surprised me by coming over during his spring break, and bringing me 10 gifts: 1 for each week before I flew back to the states. I think that was the most encouraging thing I’ve ever gotten: his thoughtfulness during those hard months. The most encouraging thing I’ve every rec’d was a lenghty handwritten letter from a friend telling me (specifically) how special I am to her and how she values our friendship. One of the most memorable gifts was a Christmas cactus. It may sound strange, but I was very discouraged after being on bedrest for 3 months with my first child to prevent a premature delivery. A good friend and her mom brought me this gift at Christmas. It was full of red blooms. To this day, it still blooms every Christmas and it reminds me God brought me through that storm with a very special present, my daughter. She was still 6 weekd early but God was good. My best friend gave me an inspirational silver bracelet with a verse from Proverbs for my birthday. Little did we know when we exchanged birthday gifts at our annual lunch meeting, my gift to her was also an inspirational silver bracelet. I have put God’s Heart for You silver necklace on my Christmas list, and would love to pay it forward and give my best friend the same one for Christmas. One of the most encouraging gifts I received was a simple Mother’s Day card from my son and his wife. It said, “Thank you for all you do – your prayers, your words, your example…You are appreciated, celebrated, and loved.” The God’s Heart for You necklace you mentioned reminded me of the message in my card. You know the simplest things can lift you up and encourage you. For me that thoughtful little card that someone sends when you are struggling so badly and really the only one that knows is God; but he laid you on the heart of that other person and they obeyed. I received a hand written letter from my mom about the way I mother my 2 sons. We’ve had a tough year with my oldest, and her words brought my to tears, gave me encouragement, and gave me confidence. She guided me to prayer for strength to get through this trying time. I kept that letter, and plan on re-reading it from time to time as the years go by. I follow on daily email. The most encouraging thing(s) I’ve received is/are little handwritten notes from my husband, especially the ones he gave me while I was going through graduate school. A local artist creates a new card each year during Christmas. A couple of years ago I was a den leader for our Cub Scouts. I was so touched to receive an honor card from a Tiger Scout and his parents. I follow you on FB. Great giveaway ! Hearing the testimony of a friend from college say that my persistence in getting her to go to church with me kept her on the right path. I had no idea until I heard her words of encouragement. I love Dayspring products so thanks for this opportunity. Great advice from a friend… a necklace I won that reminded me of lessons learned from a friends mom.. I just bought my mom’s Christmas present from Dayspring! I would love to be able to buy more! The most encouraging thing I ever received were words from my mother. She was always there for me and , although she is no longer with me, her words live on…. When I was about 19 I ended up at an eye specialist to find out that I had a corneal ulcer (one of the worst pains I have ever felt). I had started out at my regular doctors to find out that I had a UTI and an upper respiratory infection to boot. I hadn’t eaten in almost two days because of the way I felt. Needless to say, I remember that being one of the worst days (healthwise) I can remember and my attitude was not the greatest. One of the elderly women that worked at the eye specialist took pity on me, even with my horrible attitue, and brought me a pack of cheez-its and a coke to the waiting area. She was so kind and so understanding even with me not being very appreciative at the moment. A few days later, once I was feeling better, I wrote her a thank you note expressing how her caring actions touched my heart and the next time I saw here, she looked at me with tears in her eyes and said “you know, that thank you card is the nicest thing anyone has done for me in a long time”. It made me cry and I have never forgotten since then, how important it is to thank those around you for even the smallest of things…I thank God for that woman, her cheez-its and a coke! We received many special care packages from friends and family when we moved far away from home. It was very encouraging! My daughter passed away in 2008, and a few most after her funeral a friend sent me a ring with fingers clutching my finger like a baby holding onto me. This was the most meaningful gift I have ever receiveded. following dayspring and southern savers on facebook! An art piece of a lighthouse, all done with black chalk. Gorgeous! The most encouraging thing I’ve received lately is from a missionary family of 5 that sent us a 100 dollar visa gift card in the mail! The most encouraging thing I have received is the words from my parents. They always know what to say when I need it the most. I am very close to them and they mean so much to me. As a mother of two young boys I want to always be close with them and them to know they can always come to me no matter what. Just as my parents always told me. for me, the most encouraging thing is always a hand-written note from the heart. Anytime I receive a card with a handwritten note in it, I’m encouraged beyond belief. Writing is a lost art these days. I cherish them all equally. The most encouraging thing I have ever recieved is a prayer cloth from my mother. I was going through a hard time and she knew exactly what I needed. A few years ago, I was going through a tough time, and 3 of my co-workers got together and bought me a gift certificate for a 1-hour massage. That really touched my heart! The most meaningful thing anyone has ever given me are my 3 children. I follow DaySpring and SS on Facebook and I get your daily email. The most meaningful thing I’ve gotten is a particular hand written card from husband when I was having a rough time. My best gift was actually a song. My husband would call me at work late in the afternoon or on my way home. If I had a bad day he would sing to me. You are my Sunshine. He would sing the whole song and by the time he got to the end I always felt better. The most meaninful thing I ever received would have to be when my husband proposed to me with his mothers engagement. It’s really nice to be able to keep them in the family and hopefully continue to pass them down generation to generation. most encouring thing i’ve received was a stand up to cancer survivor shirt signed by all my radiation techs and assistants. When I first started teaching I was at a school where I didn’t know anyone and there were no mentors at that time. Several special education teachers who were good friends and did a lot of things together outside of school started checking on me to see if I needed any help, supplies, or wanted to go to dinner etc even though I was a regular ed teacher. We all eventually became good friends and they inducted me into the group with a Step Sister plaque since I wasn’t a special ed teacher. They really made me feel welcome and were a big help. The most encouraging thing I ever got (and still have) is the chance to participate as a volunteer for a most wonderful organization called Camp Happy Days – camphappydaysDOTorg. We have a week long camp for kids with cancer and their siblings. I’ve been volunteering for a decade now. This week is life changing and if you want to find encouragement, go to camp! I wouldn’t miss it for the world. As the mother of a teen battling Leukemia, I receive encouragement on a regular basis from the kind strangers in stores who ask her about her story, offer her hugs, prayers and sometimes financial blessings. People are always quick to offer both of us smiles and kindness. the most meaningful thing was a letter from my husband a few months after we got married (11 years ago :)) I still have it , we were struggling a bit, he lost his job and had to keep a family that was growing as of then (i got pregnant) It was the sweetest thing to do! A spontaneous hug from my teenage children! Something encouraging and special was a crocheted that my mom made one Christmas. That was the only thing she could do for me being that we were not doing well financially, it meant so much and was the best Christmas gift ever. 20 years later, I still have it and am encouraged to do something special for others even in tight times. Last year, my 16 year old daughter gave a certificate for World’s Best Mom. This was after a year of many arguments between us and me feeling like she must hate me. I framed it and it will always sit on my dresser. Following DaySpring on Facebook. They have beautiful merchandise. I have received so many encouraging things- one was cards from the students at the after school program I worked for. (One of the) most encouraging thing I received from someone: baseball cleats! A locket from my grandmother that she received on her 60th wedding anniversary. The locket has pictures of my grandparents when they were younger. My grandmother died 14 years ago and I really miss her. I know she is in heaven watching over me. I received a beautiful framed art to go on the wall. It is in my foyer and it encourages me daily and I also think of the lovely lady who gave it to me. “Liked” Southern Savers on Facebook! I follow Dayspring and SS on FB. The most encouraging thing I’ve ever received was a handmade Nativty from a Caramlite Nun. I follow by daily email – which I love. Thanks! Cards or hand written notes with scripture verses always give the most encouragement to me. I keep them in a folder and go back to reread them when I need a little extra encouragement. While recovering from surgery, my son’s nursery teacher came over and brought dinner for my family. In the days that followed, we had more food than we could eat delivered from sweet friends and family. It was very encouraging to know that God has provided some awesome friends who care for me so much! Shortly after my husband and I started attending our church, a friend set up a dinner with a small group & our pastor & his wife, so that we could have an opportunity to get to know them better. The pastor’s wife arrived to dinner with a book for me she had just finished reading, along with a sweet note of encouragement. Even now nearly 6 years later that book still means a lot to me. The most encouraging thing I ever received was a folder full of letters from my friends and family at my HS graduation. They were so uplifting and helped me remember that everything will work out in life…even when there are bumps in the road! My mother gave me several keepsakes that belonged to my grandmother after she passed away. They adorn my coffee table and I treasure them! When I was pregnant with my daughter, I was completely nervous. So my grandmother (who adopted me) gave me a letter from my grandfather, who had died 5 years before. The letter was one that he had written her when she was pregnant. In it he talked about how much he loved her, and how strong she was, and that he knew she was going to make a great mother. She said she just found it one day around the house, and felt he wanted her to give it to me. A journal that led me to start journaling with my 1st child! one of my friends telling me and encouraging me that I can do something, that was hard for me to do, she told me every day! The most encouraging thing I’ve ever reeived was a hand written card from a friend. I follow dayspring on facebook! I would have to say the most encouraging thing I received from someone would be a heart necklace with a very encouraging card from my dear friend. One of my bosses sewed this little heart and attached a saying to it and gave us this jar filled with inspirational daily quotes to help us get through the day. I received a necklace with a cross and 2 circles for my wedding from my husband 33 years ago and I still love it and wear it. The most encouraging gift I’ve ever received was a check to use to self-publish my first book from my Grandma. It meant the world to me to finally have the funding to get my book out there! notes from my nubby that he writes to me nearly weekly are always a great pick-me-up. My band teacher in 9th grade told me I should try to go to Julliard after high school for playing the clarinet. most encouragin thing I’ve received is a thoughtfull, heartfelt card from a friend. I love Dayspring’s products! The most encouraging thing I’ve received is a hearfelt handwritten note from my sweet mother when I was going through a difficult time. I follow Southern Savers and Dayspring on facebook. When my husband and I were about to get married, my husband worked for an adult group home for mentally handicapped. He invited me over to the home one night for a get-together with 2 other homes. When I got there, I was greeted with a surprise! It was a surprise bridal shower. The most encouraging thing I’ve ever received was a hand written card from one of my Bible study group members. She had just completed a brave journey of reconciliation with the Lord, and she was thanking me for my part of sharing God’s love and mercy with her. I cherish it and carry it with me. Encouraging words from a friend when I was going through a difficult time. I follow Dayspring and Southern Savers on FB. The most encouraging piece I have ever received was a sterling silver hour glass necklace that told how precious time is and we need to live each moment as it could be our last. Box of crayons and paper and told to continue being creative. The most encouraging gifts for me are the unexpected ones. A friend gave me a plant/bush for my birthday, just because at one point she’s paid attention and remembered I said that would be a great plant to have in my new yard. I never thought of it again, but she remembered! Thanks for the giveaway! I like Dayspring Products. Thanks for hosting the giveaway. My grandson, who was 5 at the time, gave me a bracelet that he got to pick out himself at school last year. every piece of art my sons have ever giving to me is meaningful. Thanks alot. i follow you on fb, and twitter and tweeted this giveaway. The most encouraging thing I received was a story from the pastor of the church where I work. It mirrored something I was going through and helped me work through some real anger. The most encouraging thing I’ve ever received from someone was a handmade marquetry Christmas Card from my Dad and a stained glass handmade nativity scene from my uncle. My uncle passed away this year, but I keep his nativity up year round as a reminder of him and that I’ll see him again. I follow Southern Savers on daily email. I have been encouraged so many times by loved ones and friends that I can’t name them all. The Lord is good to me. My most encouraging item received is my Bible, from my parents when I was in high school. There have been moments I don’t know what I would do without its guidance! The most encouraging thing I have ever received was a guardian angel coin. I was having a difficult pregnancy and a friend sent me the angel to watch over me. I think the notes that I’ve received from people have been the most encouraging things! LIKE Dayspring and Southern Savers on FB- Kimberly F.
An I love you from my hubby with a kiss on the forehead is one of my most encouraging things! My daughter gave me a willowtree container that had favorite Bible verses written inside. I am now a follower of Dayspring on FB and I get your daily emails! When I was going through a hard time, a coworker came into a room I was by myself working in, laid down down an encouraging prayer card, and walked out. No 20 questions b/c my coworker knew I’d tear up. No words at all. But thoughts of prayer and encouragement. I carried it in my pocket for months and pulled it out and read it on hard days. One of the most special things I received was my Bible. It is one of the few things my dad wrote in for me. It will always mean a lot to me. The most encouraging thing I have ever received was a jar filled with daily inspirations. I was supposed to pick one every day! It was great. Encouragement from my in-laws has always meant a lot to me. They’ve welcomed me into their family with open arms! Following Dayspring and SS on facebook too! This may sound mushy, but the best encouragement I’ve ever gotten is a hug. :D It warmed me up. A card from a friend after my Dad died. The words in the card meant so much. When a teacher told me I wasnt dumb. I love hand-written notes that encourage me. The most encouraging thing I ever received was an email from a former student thanking me for being her teacher. She gave me a hard time but I never gave up her. She moved to a new school and scored the highest score in her class on her end of course test. Her email gave me the encouragement to continue doing what I do for all of my students. a friend sent me an inspirational book! most encouraging thing ever received was when my daughter’s teacher met me for the first time and she said, “Oh I have heard so many good things about you. I have heard ____ and ____. And i said oh from who?? and she smiled and said, “your husband”. That was the most encouraging thing ever given to me. . the praises of my hubby. Thanks for the generous giveaway! I recently got a card from someone at church that really was encouraging. Thanks for a great giveaway! My boss – she bought me a box of Godiva chocolate when my promotion did not come through. She was just as disappointed as me that they did not consider her recommendation. She did not have to get me anything, but she wanted to send me a message that she appreciated everything that I was doing. The most encouraging thing I have received was a book of prayers from my grandmother. I like both you and dayspring on fb. 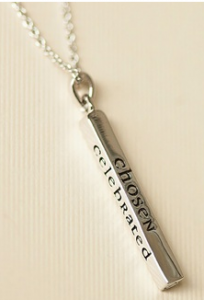 The most encouraging material item I received was a piece of adoption jewelry. A note specific to me. I follow southern savers & day spring on facebook. My husband wrote an encouraging note in my bible when he gave it to me about how proud he was of me. I like you both on facebook and get the daily emails! My encouraging things are my children, having them love you unconditionally is a gift from god!.. The most encouraging thing I ever got was a picture of a tree with the attributes written around it “strong” “loyal” “chosen” “thoughtful” “nourished” and “well-loved”. It was a gift from my parents as I went to college to remind me of home and remind me of them. It cam with a stick from our backyard. My mother made the entire thing. My fiance is my daily encourager! acceptance letter from the school I wanted to attend. Two compliments that were given to me from two different people always stick in my mind. One from a lady that told me that I had more humility than anyone that she had ever met. A man told me that I was the real thing concerning my walk with God. This two compliments will forever be special to me. I try to live up to them each day. The love of “my wonderful guys”! I would say the most encouraging thing I have received was just out of the blue for no reason card from a friend, that just said “you were on my mind today”. It came at a time when I was feeling so alone and was exactly what I needed! Probably one of the most encouraging things I’ve ever received is one of several books that I usually get. To me, books are about the most encouraging things you could ever get. The most encouraging thing I ever received from someone was to see all the hard work that my stepfather did to make a better life for me. My sister gave me my first journal…it encouraged me to write and that in turn was the greatest gift ever! I received a necklace charm that is 3 peas in pod for me to wear in anticipation of our 3rd child (we’re adopting)! I thought it was so thoughtful. And I love it! The one of the most encouraging things that I ever received was from a secret santa, I got an angel and it said you are an angel in my life. The love from my mom and dad. When I was accepted into the paramedic program, my husband, who was a flight medic at the time, gave me his very first stethoscope to use during my clinicals. The most encouraging gifts I received was a Bible study book from my mom that she had gotten for me, my sister, my 2 sisters-in-law, and herself for us to all read and work through together! I follow Southern Savers & Dayspring on Facebook! The most encouraging gift I have ever received was from a lady I never had the honor of knowing. She would send my Mother gifts often and at one of the lowest points in my life, I received a package from her through the mail. Enclosed was a silver necklace with a charm on it. The charm holds a center piece that spins and on each side, inscribed in hebrew the word “JESUS”, but if you spin the center piece it reads “JESUS” in english. I still to this day have that necklace and it hangs on the rearview mirror in my car…I always know that “JESUS” is with me!! I like Dayspring and Southern Savers on FB. A necklace from my sister-in-law that said I Believe in Miracles when I went through 2 major surgeries in 2008. Liked DAYSPRING and follow you on facebook! The most encouraging gift I ever received came from God himself. He gave my son to me, whom is a constant reminder of God’s love. My son brings joy to my life everyday and reminds me that God has big plans for our lives. A note from one of my students that said how much I meant to them and how much they had learned. It was so special! The most encouraging thing I have received is a letter from my Mom, when my son was born. I have it kept tight in my “treasure box” and anytime I feel like I’m failing as a mom, I pull it out and read it. Prayers are the most encouraging! I love jewelry as well and even more with the gospel message! The most encouraging thing I ever received (or at least the first thing that comes to mind) was a note that my cousin wrote me when she was five. In her own cute little handwriting with misspelled words, she wrote about how much she loved me and how she wished I was her big sister :-) She’s all grown up now with a new baby of her own and she will be a great mama! I like Dayspring and Southern Savers on Facebook. To always finish what you have started. I received a call – out of the blue – saying a friend was praying for me! I’ll never forget the first encouraging gift I received – a single balloon from my dad while I was in middle school. It was the day after I failed to make the cheering squad and I was crushed. He always knew how to make me smile! I was very sick 2 years ago and had lost my voice. I had a vocal cord implant surgery so now I can talk. A friend sent me a beautiful quilt that she made by hand…. I wrap up in it every night while watching TV. I treasure that gift! The most meaningful thing I ever received was a heartfelt thank you note from a family whose home had burned down and lost everything. My family adopted them through the Salvation Army locally and provided christmas and essentials to them. A complete stranger wrote me the most beautiful thank you note that I still have and brings me to tears just thinking about it again. The most encouraging thing I’ve ever received was a wheeled leather portfolio bag from a very close friend when I was in college with a note attached that said this is for you to use when you fulfill your dream of becoming a teacher. Like Dayspring on facebook ! The most encouraging thing I have ever received was the love and support of my grandmother growing up. My mom and I were not very close and without my grandmother, my teenage and college years would have been awful. Thanks, Miney, I miss you everyday but I know you are still cheering my on from the clouds. Most encouraging thing I ever received: Would have to be my son. I can go through ANYTHING for him!! To see his smile, hear his laughter, watch him grow, makes lifes hardest moments melt away! The most encouraging thing I have received was a simple card. Working at a school as a teacher’s assistant and the teacher just quit with no warning. We were without an official teacher for months. It was very stressful on me and the special needs kids in the class. All the other teacher assistants got together and signed a card of encouragement for me and it meant a lot to me! the most encouraging thing are the Grandmother books I received. Now, that my grandmothers are passed I cherish them. Notes written from my mom. She is the best! A framed quote reminding me of the important things in life. A daily prayer book from my husband at a time when I was not in a good place. I received a framed picture from my son, who had a hard time spending money on anything. I was invited to a fellowship church sermon and my name was announced in a prayer letting me know that I had been said a prayer for by the person who had invited me. When I was away from home at college and sick in bed with the flu, my sister came and brought me medicine and hot tea with honey. It wasn’t home, but it was the next best thing. The week I was diagnosed with MS, a friend gave me a bookmark that was a cross with the word FAITH engraved on it. The most encouraging gift I ever got was words, actually! I belong to a homegroup from my church and we choose one person a month to focus on and encourage. We start by telling the people what we love and appreciate about them, and then we pray for them. I was completely undone when they shared their words for me. I want that necklace it is beautiful! I am following Dayspring and Southern Savers in hopes of winning the Dayspring giveaway!! The most encouraging thing that I’ve ever received from someone is a reason for faith! The most encouraging gift I have ever been given is the 24/7 support of my father when I became a single mother. Whenever The baby and I would enter the room grandpa would literally jump off the couch! The most encouraging thing anyone has ever given me was my step dad who to me was my father. My mom worked so hard for us and our birth dad was very abusive. My mom showed us that life didn’t have to be that way and she took us out of there. She met my father Gabriel and he encouraged me to get an education, to be the person I am today. He passed away from cancer in July of 2009 and it’s been hard, but I just try to remember his words, “God makes all things possible”. I’m 27 and living proof that when things don’t begin right God can change that and have this big picture ready for you to just grab a hold of. The most encouraging thing(s) anyone has ever given me was/were hugs my mom gave me when I am down or discouraged. The most encouraging thing God has giving me was my LIFE. Nov.13,2008, I fell and hit my head. I was in a semicoma state for 3 days, woke up and had no memory of my life, the only person I knew was my MOM. She passed 2 yrs ago with ALS. I had to relearn how to eat, take a shower, education, but most of all, I went home with a Stranger and 2 beautiful girls. I forgot my education so now at the age of 37 am back in school. I have come to learn how to love my family, but it is a work in progress. The most encouraging facter is that before I fell I do remember studying the Bible, and when I began to speck, my langage changed, I lost my southern accent and speck now as of King James Bible langage, with a English accent. Not to boast but I, myself with Gods guidance encourages myself to get up a try to be the best Wife, Mom, Friend, Sister, Aunt, Daugther, in which I can be. I am very humble to the fact that I am alive and breathing to be able to encourage others with my story. When I was recovering from an addiction, my priest came to pray at my bedside and as if that weren’t the most wonderful gift ever, she brought me a devotional that was written for people going through that very process of giving up an addictive substance. It was truly heartwarming and encouraging and has been one big reason that I’ve made it through my first (of MANY) 5 years. I could so find something from daysprings to give her for Christmas or to give to someone else in my shoes 5 years ago. I follow both and have signed up for your daily emails! The most encouraging thing anyone has ever given me has been a phone call just when I needed specific words of encouragement and prayer. Means more than any physical gift I could ever recieve. Following Southern Savers and Dayspring on facebook! After my 1st miscarriage a friend sent me the Footprints in the sand card. I follow you and dayspring on facebook. I follow you and dayspring on facebook…. One of the most encouraging things I have ever received was from one of my doctors. I don’t think he was even trying to be encouraging. I have a chronic autoimmune disease that affects my eyes. Law school was horrible on me with all the reading and studying. Through it all one of my specialists was always asking about how school was and what I was studying and how finals were and the like. The fact that even though he saw my illness for what it was and how hard it made school for me he was always positive that I would finish made me sure that I would too. A hug and kind word right when I need it encourages me most. When I was working full time and then decided to go back to college I had a friend give me a card with many encouraging words. She has always been a great friend and cheerleader for me. I am blessed to have her as my friend. I would love to share this gift cert with her. I’d love to win! thanks for sharing! I follow Dayspring and Southern Savers on FB! I am a teacher of students with special needs and just this week I received the most heart felt thank you letter from one of my parents letting me know what I great job I am doing and that they really appreciate all my hard work. That was most certainly encouraging to hear! When my son was born 11 years ago, they thought he was going to need surgery and sent him by ambulance to another hospital. My friend/coworker brought a bottle bag filled with body wash, magazines and stuff to keep me occupied while I waited to find out what was going on with my baby. She was so sweet I cried even harder! The most encouraging thing I’ve ever received were words of encouragement from my 4th grade teacher. She made me believe I could do anything. I follow through daily email.. I received a fabulous gift from an employee in another department yesterday when, unknown to him I had just been told I was being demoted and all but told to leave the city where I work, he saw my name on my id and told his buddy next to him, “she’s ours, the one we call for help- she’s great.” He made me feel 10 feet tall knowing I had the respect of the guys working in the field, especially when things were going so cruddy. I follow on daily emails! During a tough time a card filled with encouraging words I needed to hear at that moment. A hug and kind word right when I need it most. The most encouraging thing I received from someone was a willow tree angel when my mom passed away suddenly. Being told that I could handle anything that God gives me when he gave me a child with special needs and she was right!!! My daughter is special in so many ways, not just the physical disability that she has to battle each day! Support from family and friends during a difficult time. A card waiting on my desk at work during difficult times. The most encouraging thing? God gave me my children. They encourage me to be the best I can be, everyday. I have to say it would be a simple thoughtful note of encouragement. A friend gave me a vase with Proverbs 3:5,6 on it to use in my dining room. A handwritten note from a friend that I can keep reading when things get tough. My mother had just passed away and one of my students gave me a hand-written note telling me how God was watching over me and my mom. I thought it was profound that a third grader knew exactly what I needed to hear. At my highschool graduation, I was given a devotional book that I still love to use! Follow SS on Facebook and daily email. Still today, the most encouraging thing someone can do is to say that they’re praying for you. Someone gave me a rosary that I still use and cherish today. :) It was even more special that it came from a student of mine. My Grandmother gave me my first Bible. My grandmother gave me a collection of her earrings shortly before she passed away. My daughter and I wear them as often as we can – its a little way to remember her. To me the most encouraging thing I have ever received are hand written notes from friends. They mean so much and can be saved and read over and over again. When I married my husband I recieved my step daughter she was 4 years old at the time. She is now 11 and I never though how much she would change my life. It gave me a chance to shape and mold this beautiful child. I am so proud of her how she is becoming a young teen. The most encouraging thing I ever received was “a key”. My younger brother had gotten killed in a car accident on his way back to school. Needless to say it was devastating. It was hard enough trying to grasp what happened but then family and friends were all over everywhere asking questions and trying to help. Although I knew there intentions were good, it was totally overwhelming. At times I just wanted to sit somewhere quiet without phones and doorbells ringing. One of my best friends came by and he gave me a key to his apartment. He said, I know you have a lot goin onand you’re probably stressed out. Just use it if you need to get away and get your head together. He said, you don’t have to call first or anything, I understand. That meant so much to me. I received a gift with this quote, ” All the darkness in the universe cannot hide the light os a single candle”. Encouraging words fromy dad. He always finds a way to sneak them in before a big event my life. My mom writes me nice notes to brighten my day. These are great Christmas gifts! The most encouraging thing I’ve ever received from someone are my two children. They are an inspiration to be a better person everyday. Our pastor gave my husband & I really great pre-marital counseling.We weren’t even officially engaged yet, but he spent time with us anyway. That was a great gift. My little girl (5) at the time said “Mom I know its hard being a Mommy but you make it seem so easy!” I gave her the biggest hug and stole away to my private place for a big ole cry! She encouraged me at a time when I really truly needed it! The most important thing I have ever received from someone is faith. My daughter was born with cerebral palsy and she has the biggest heart and more love than anyone I know. Even though we are losing our home, she still thinks of others everyday. She always tells me that there are others out there that have less than we do. Every Christmas she tells me to buy for children who will not have any presents instead of buying for her. What a great child that God gave me. I received an antique rosary from a lady in our church that she had used almost daily. Every time I use it, I am reminded of her. That would definitely be a brand new AC unit for our home!! My son was in treatment for cancer – our unit went out out – no fixing it. Money was incredibly tight and we were under so much emotional stress. My husband went to talk to the owner where we were going to purchase the new unit to see if we could work out a payment plan. The owner told him it was already covered – men from our church had already paid in full!!!! I don’t think there is ever a time that we pull into our driveway and look at that big ole unit and get a few tears in our eyes ……. a constant reminder to us that God is our Provider. My husband is the youth pastor at my church and I work closely with him. Youth ministry is often a thankless job and it may take several years to see the fruits of your labor. It can be discouraging to feel like you’re giving everything you have to your students and they still don’t get it. But God is always faithful. Last year at Christmas, the parents of 3 students (siblings) in our youth group, gave us the most beautiful card with a beautiful passage of scripture it. They basically said thanks so much for all you’re doing for our kids. They are learning & growing and we have seen such a deeper love for God from each of them. The scripture was Romans 10:14-15. “How, then, can they call on the one they have not believed in? And how can they believe in the one of whom they have not heard? And how can they hear without someone preaching to them? And how can anyone preach unless they are sent? As it is written: “How beautiful are the feet of those who bring good news!” My husband and I moved from Indiana to Florida to be the youth pastors at this church and they thanked us for obeying the call and coming down here. They thanked God that he sent us here and ended the card with this, “Your feet are beautiful.” It was so encouraging to me to feel that we are making a difference in the lives of these students and that they are growing in their relationships with Him. It was a beautiful reminder of God’s perfect plan for our life. I also like Southern Savers on Facebook. my husband surprises me with little post-it notes sometimes stuck to our mirror so i will see 1st thing when I get up. they are always very sweet & simple notes, but it makes my day!!! A glass sparrow my aunt gave me before I had surgery & a note saying God loves & takes care of me even more than the sparrows. It was such an encouragement. We pass it along to family facing surgery or cancer to remind us of God’s love for us. Shortly after my husband died, an older woman from our church began sending me articles relating to the grief process. They were copies of things she had been sent by a friend when her husband died. These women were most certainly “passing it on” and I so appreciated that! For graduation, my parents gave me, among other things a card with a “life verse” written inside that they had chosen for me to think on and to inspire me through life. Very special. My mom and grandma put together a recipe book with all of our family recipes, in their own handwriting. My grandma has since had a stroke and can no longer cook, so more than ever, I cherish taking those recipe cards out and following her handwritten instructions. One of the most encouraging things I have ever received, was a call from my aunt at a very difficult time in my life. She said that I would get through this, to wait on the Lord, and that he never puts more on us than we can stand. I have never forgotten that. When I moved away from home for the first time my family sent cards of encouragement, flowers and they phoned just to check in on me. I was lonely but they definitely made it bearable. I received a plaque from my church for volunteering with the youth program making props, etc. The plaque stated “In recognition of your God given talents”. It’s one of my most prized possessions! When I left my church to begin ministry with my new husband at the church he worked at, my church family collectively made a quilt for me. All the families/people that I was close to decorated and wrote to me on their respective squares: words of encouragement, verses, poems. By far the sweetest thing a group has ever done for me. And it was so beautiful! The most encouraging things for me was when parents would write me letters/emails about how much their child had learned in my class and when my mom would send me heartfelt cards about the “good”mom that I am. I was a teacher for 8 years, and the best gifts were always the heartfelt inspirational notes from my students! The most encouraging thing I have ever gotten was a necklace from a friend when my daughter was born 3 months early and in the NICU for 110 days. The necklace had 3 charms on it (a cross, and my two children’s birth stones on it) so that I would always know that God was with me as were my two children although I couldn’t be there every moment with her as I wished I could have been. Notes and cards from my kids and husband. I love following you and have added DaySpring to my “likes”! I follow SS on FB and receive e-mails too! When my mother passed away suddenly last year, the children I tutor in reading sent homemade cards to me, it turned a very sad occasion to a feeling of thankfulness and joy. The texts I got after singing this week. I was asked to perform and a luncheon (with the mayor and many councilmen attending) and I was so scared and nervous. Afterwards, the woman who had invited me ( a long time friend and mentor) texted me and told me how proud she was of what I had done. Many other friends did so as well, even some who were not there but knew of what I was doing that day. Thoughtful handwritten notes and a heart felt poem that my daughter wrote for me. I don’t know it if this is THE most encouraging gift I’ve ever received, but it has to be at the top of the list. My first year as a teacher, my father passed away and three of my students gave me a cross necklace. One of their mothers (a coworker) came to me when I returned to work and told me a little story them picking out the necklace. Her daughter had told her, “Oh, we need to get her a cross. She has a strong faith.” And, her mother told her, “Good, that is the only thing that will get her through this.” The comments, the observations of that student was the gift in essence. The most encouraging thing you’ve ever received from someone is a kind word and hug. I once got a “You can do it” figurine when I was writing my dissertation. A heartfelt letter telling me the ways they see the Lord living in me & using me for His work. The author also reminded me that being a mother is often a thankless job but it is worth it all & the Lord is blessed when I serve Him as a mother to my boys. The Word of God is the greatest gift and love letter anyone could ever receive. He reminds me daily of how much HE loves me and teaches me I am an overcomer in this life.. I am following DaySpring and SouthernSavers on facebook. The most encouraging thing I have ever got from someone is when I was 16 my parents got me a ring that simply said “purity”. As a teenager if I was feeling peer pressure to “do” something I didn’t want to or knew I shouldn’t, that simply ring was a reminder to me that I can still keep my “purity”. I am following dayspring and southern savers on facebook. the most encouraging thing i received was support to participate in a half-marathon. i was so proud to have completed that difficult distance and wouldn’t have done it without the words of friendship. I follow dayspring and Southern savers on Facebook. Words of encouragement are what I have been given all through my life from the people who mean the most to me. Especially through the difficult times in my life. Just hearing it will be O.K. or you will get through this can really push you through the hard times in your life. Lately I recieved a journal from a special friend. My husband and I have been trying to become parents for some time now. There have been so many ups and downs through this whole process. We are both 44 years old and know without a doubt God has a special plan for our lives. I have shared my hopes and dreams with her. My dear friend gave me a special journal where I record my prayers to God. It is very special to me. I “like” DaySpring and southernsavers !!! When I was getting ready to move out of the area for grad school, my church held a farewell potluck brunch where they gave me a “money tree” – definitely some of the most caring people you could ever hope to encounter! Going through a divorce, with a 1 yr old and a newborn, working full time…a friend got extra key from my landlord and cleaned my whole house, dishes, 6 loads of laundry, etc. Still makes me cry thinking about it. the most inspiring thing I’ve ever gotten was a wall hanging. The most encouraging thing I have received was my grandfather’s medals from the wars he fought in along with the pictures signed by the Apollo crew he helped launch. A letter from someone I didn’t know that well telling me how great a mom I was. I have kept that for over 7 years now. I think it was a letter from a friends Mom while I was in college. It was such an encouragement. A Bible from my grandmother on my 13th birthday. It had my name printed on the pink cover. A hug when I needed one. The most encouraging gift I’ve received was a beautiful, leather bound Bible from a fellow believer. Loved it then, love it now. I was feeling depressed & my daughter wrote me a letter telling me how much she appreciated me & all I had done for her. Sure made my day! When my daughter shared how she was able to forgive someone because of my example. A card from my mother. Someone telling me that me being at church added to the organization there. My husband cleaning up the kitchen and putting the kids to bed after I’d had a long day. I like both Dayspring and Southern Savers on Facebook. The most encouraging thing I’ve received is time from someone that gave me words of wisdom and encouragement when I needed it most. It hasn’t been a tangible item. I posted the giveaway on Twitter. I’m following Southern Savers and Dayspring on FB. the best thing i have received was their time and love. There were so many days of frustration adjusting to our new blended family life and becoming a stay at home mom again. It meant so much when my husband told me that I was an awesome mother and wife. A hug is the best thing I think I’ve ever been given! Notes of encouragement from family and friends is something I cherish. Handwritten, heartfelt letters are my most treasured gifts! I received a women’s prayer book while my son was in the hospital. Much needed then and now. My oldest daughter (10) just gave me a Top Ten List of all the things I am good at….the most encouraging and treasured gift I have ever received!!! I would love to win this and buy her some inspirational jewelry with it. Like SS and Day Spring on Facebook!!! I am following southern savers and day spring on FBI. The most encouraging thing that I’ve received is a phone call from a friend, just to check up on how I’m doing. A letter my husband gave me on our honeymoon he hid in my suitcase… 8 years later … still have that letter!!! My husband and I got married two days before Christmas. He gave me a Bible for Christmas that year, with the most beautiful letter in the front and my new married last name engraved on the front. What a legacy to our children that we started out marriage off putting God first above all. I am following Day Spring and Southern Savers on Facebook! I would say letters or emails from my brother encourage me more than anything! When I was a new believer, I received many encouraging notes and letters and also, the letters my husband sent while we were dating long distance are still my favorites! When I was in highschool, my father passed away and my classmates got together and made a wonderful card with many notes of encouragement and sympathy. It really meant a lot to me. It always means so much when my friends from out of state send cards that speak of how we are so close and so far away at the same time .I have wonderful friends!!! When I was in undergrad I worked at a Christian camp during the summer. My second summer there, my guitar (which I cherished so very much!) was stolen out of my friend’s locked car. I was so upset for the weeks to follow, since I had no financial means to replace the guitar. In the month of July, the camp has a “Christmas in July” week for the campers. It is always a lot of fun, and everyone makes crafts to give as Christmas presents on “Christmas morning” (the last day of camp). I woke up on “Christmas morning” to find a guitar with a bow wrapped around it sitting outside my cabin door with a note “love, santa”. The gift was suppose to be anonymous, but I knew it was from the pastor that lead the camp. I recognized the guitar as one that he had passed down through his 3 sons. I still have the guitar and remember his love, generosity and encouragement every time I play it. When I was stumbling back to GOD after a long separation in our relationship ( I left he never did) a friend gave me a card encouraging me to keep taking my baby steps in Faith and a small faith, hope, and love plaque with the promise of a larger one to be given at a later time. It was a symbol that my faith at the time was small but that she believed it would continue to grow. And it certainly has! A card from a friend that moved away. The most memorable gift that I received for Christmas one year was my grandmother’s Bible that I had watched her read as a child. It brought back warm memories of her love for me and God. The most encouraging thing (intangible) I have ever received from anyone is God’s grace! The most encouraging thing (tangible) I have ever received from anyone is a love letter from my husband! One of the most encouraging things I’ve ever received from someone was a recent card to tell me how thankful someone was for me and my helpfulness. It meant a lot to know someone was paying attention. I think personal notes of encouragement are really powerful – especially when they are sincere! Dayspring has a great card collection that can help those encouragers! I liked Dayspring on Facebook- love their stuff! My husbands unwavering encouragement to accomplish anything I want! Support from my husband to adopt our oldest son. I started participating in the Zumba group that is sponsored by my church. Every time I attend my prayer bucket is filled back up and I get the support that I need to get through the week. Not only do I get the strength that I need for my body, I am renewing God’s temple by attending! I love my Zumba group and the ladies I attend with! I was in a meeting one day and noticed a bracelet someone was wearing. The bracelet had written on it “Never, never, never quit”. When I asked her about where she got it, she took it off and gave it to me. I have since bought one just like it and did the same thing to someone who asked me about it. The saying was what my mother always taught me as a child…..never, never, never quit! At one time in my life I was in the hospital for sever depression. The cards and letters from people all over were a big encouragement for me. I am free of depression now!!! Most encouraging thing I’ve ever been given was a phone call and someone asking me how I was doing & really wanting to hear the answer. When I was a young mom of two little ones ….. in a new area with no friends ….. and felt all alone and down …. I joined a local MOPS group and I can not even tell you what an encouragement those other moms were to me …. I no longer felt alone. I don’t know about the most encouraging. I do love the jewelry and home decor from Dayspring, though. I follow Day Spring and Southern Savers on FB. The loyalty of my best friend through all of these years. One of the most encouraging things I received was a booklet put together by students and teachers recommending me for teacher of the year! The words the students wrote were priceless and made me feel that I had done my job! I follow Dayspring and Southern Savers on facebook and subscribe to emails. One of the most encouraging things have had done for me is just to have someone tell me that they are praying for me during a difficult time. I was pregnant with my 4th baby and had found out that something was wrong with her. Doctors were not sure what was going on but had me scared out of my mind, telling me she wouldn’t live but an hour after birth. I was shopping one day at a local flea market and this older man came up to me and gave me a HOPE beanie baby that is kneeling in prayer and told me that he felt led to give it to me and to tell me that I should keep praying about my situation. I did keep praying and God gave me a peace about my little girl and, although she has some issues, she is alive and is 10 years old today!!! I tweeted and I follow SS on FB and by email and now follow Dayspring on FB too! I follow both SouthernSavers and DaySpring on Facebook. I tweeted the giveaway. The most encouraging thing is the words of comfort and prayers I receive from friends and family. After I lost my cousin/ best friend my friend at work gave me a Willow Tree angel for my desk to remind me of her every day. The most encouraging this I received wasn’t really for me. Someone helped me afford Christmas for my kids last year. That meant everything to me. My first Bible! I was about 5 years old (and still have it). My mom gave it to me. Of course, I didn’t understand the full meaning behind it until later on in life. Through all my difficult times (the divorce of my parents, my own divorce, health problems etc) what could be more encouraging than God’s word, his love and his comfort. My bible that my Dad gave me when I was just a small child. It is pocket size and has my name engraved on it. I still carry it in my purse everyday. A random card in the mail while I was going through a difficult time. I received a gift wrapped small box that says something about I am being prayed for so just keep the box and look at it as a reminder…I wish I kept it but it was years ago. Already follow Dayspring and Southern Savers…yea. A photo album full of cards and photos of me and my grandmother that had just passed away. A recent one was when our neighbor brought us dinner after my son was born. I am following SouthernSavers and Dayspring on FB. Oh, I guess I should say that I LIKE you both on FB!! Any time my kids say thanks for the work I do! When I left my job to be a SAHM my boss wrote the nicest note telling me just how valued I was as an employee and that I was always welcome back. The most encouraging thing I recall lately was a comment a new friend had made to me. She had observed my willingness to help my husband when he needed my help, regardless if I wanted to or not. I never noticed this about myself, but knew I tried doing this daily. It was encouraging to know that perhaps I was succeeding in some small way…. It would have to be a bible from my parents – I am happier than I have ever been in my life! My marriage is better, my kids enjoy mom more and I don’t let the little things get to me like I did when I was younger. The most amazing encouragement I ever received was from my oldest daughter. I was struggling through a difficult time and she hugged me close, led me to the bedroom, and sat on the bed reading Scripture to me. most encouraging gift was a necklace with a profounding message on it. I’ve liked DaySpring and Southersavers on FB. I received a prayer box from a great friend of mine. The most encouraging thing someone gave me was a hug! my daughters are looking for some necklaces for Christmas. These are great. The most encouraging thing that I received was a personalized motherhood ring. the most encouraging thing that i have received is the look on someones face when i volunteer at thanksgiving delivering food to needy families. A handwritten note was easily the most inspiring thing I’ve ever received. A snowflake necklace from my son. a bible that i got from a total stranger, its been the most inspirational thing ever! The most inspirational thing I ever received was a bracelet with the word HIS to remind me I belong to God.